So Your Company Royally Screwed Up On Social Media… What Now? Ladies and gentlemen, welcome aboard today’s flight. I’d like to direct your attention to the television monitors. We will now be showing our Social Media safety demonstration and would like the next few minutes of your complete attention. And in other news, I no longer feel so bad about those times I've tweeted out an incorrect but entirely SFW link.
.@USAirways My boss walked in and saw that pic on my terminal and now I'm fired. Can I have the job of the guy you fire for posting that? Meanwhile, Chipotle saying "Oh good, we're finally no longer at the top of the list of social media screw-ups." Social media is a key component of most companies' marketing strategies, and if it's not, it should be: 80% of US respondents believe that social media enhances the reputation of a participating company. It's a great way to engage your targeted audience and share your quality content in order to drive leads, but, as with anything published on the internet today, it can come back to haunt you. The viral nature of social media has proved itself, time and time again, to be both a blessing and a curse. US Airways isn’t the first to screw up royally on twitter, and they definitely won’t be the last. Mistakes happen and when you’re managing a social media account for your company, you need to be prepared for if, and when, they do. So what lessons can we learn from US Air’s mistake? What can you do to be prepared in the event of a social media flop? 1) If you screw up, apologize right away. You should establish an emergency procedure and make sure that anyone with access to your social media accounts is made aware of the procedure. Obviously you’ll need to apologize and begin to address the situation immediately, but who, specifically, within your organization is responsible for handling that? Have a specific procedure laid out from the start and you’ll be able to address the situation objectively, rather than going into crisis mode and potentially adding insult to injury by handling the already-bad situation in a less than stellar way. 2) Explain what you’ll do to fix the situation. It can be as simple as US Air’s response, stating that they’ve removed the tweet and are investigating. Because you’re addressing the situation immediately, there’s a good chance your company hasn’t made an official decision in regards to how you’re going to fix the situation, and you might not even have all the details as to what caused the issue in the first place. It’s easy to blame the individual who wrote and published the offending post, but is there an underlying reason as to why the individual made the mistake? In the case of US Airways, it seems as if the mistake might have occurred as a result of lack of attention to detail, in posting a link and not double-checking to make sure it actually linked to the intended source. But in the case of British Gas in October 2013, the issue lied in their strategy and failure to consider potential negative outcomes. It probably wasn’t the best idea to invite all of twitter to express what they thought of the company, by tweeting them using the hashtag “AskBG,” on the same day they announced an energy price hike of 9.2%. Our Customer Service Director, Bert Pijls, is answering your questions until 2pm. Tweet using the #AskBG hashtag. #AskBG Can you recommend a good energy supplier? In my opinion, someone should’ve seen that coming, or at least considered the potential for that kind of disaster. BG’s twitter Q&A fail is a prime example of why it is so important to think about all potential negative outcomes or consequences before your company plans to post on social media before its been published and the damage is done. Lundon Luton Airport is another company that caused quite the uproar when they posted this photo of a plane crash in Chicago in 2005, in which one child died. 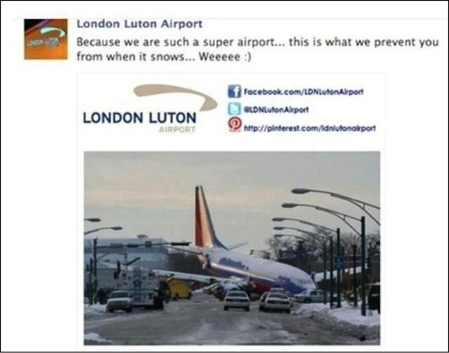 They used the caption, “Because we are such a super airport….this is what we prevent you from when it snows……Weeeee"
Just because someone claims to be a “social media guru” and has a lot of twitter followers or earned a degree in Marketing or PR, doesn’t necessarily mean that they’re qualified to represent your entire company via social media. If the person isn’t familiar with the tools they’re using or doesn’t pay proper attention to detail, they could end up with a mess on their hands like Celeb Boutique did when they posted this tweet after the August 2012 movie theater shooting in Aurora, CO.
Whoever wrote this clearly had no idea what was going on in the world or why the #Aurora hashtag was actually trending, which means they had no idea what kind of research and strategy should go into a social media post… Not someone you should have managing your company’s social profiles. 5) Regardless of what happens, it’s important to remember that we’re all human and we make mistakes. US Airways has stated that they aren’t planning to fire the person who published Monday’s inappropriate tweet because it happened as a result of nothing more than an accident. I’m assuming he’s pretty excellent at his job and has never done anything like that in the past, which probably is why they’re willing to let it slide. I think it’s great that they’re giving him a second chance, and I’m sure that even if he gets to keep his job, he’ll never hear the end of the incident anyway, which is probably a pretty harsh punishment in itself. What do you think about US Airway’s twitter fail? 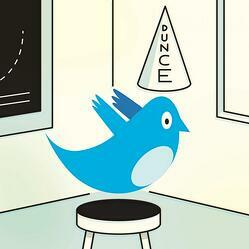 Has your company ever had to address a social media slip up in the past? If so, how did you handle it? Let us know by writing a comment below!